Buttery and Moist Blackberry swirled Vanilla Pound Cake that is loaded with Sprinkles, masked with sweet and fruity blackberry glaze, then showered with more sprinkles…Sigh!!! Which one would you select between a buttery blackberry swirled vanilla pound cake and a sprinkles loaded fun packed funfetti cake? Confused? Want both?? Ha! Caught you. Okay. Lets not trick you anymore! You get to have both. What? Not one in each hands of-course. But you are gonna bite both of these cakes in a single slice every mouthful, each bite and every crumb! Yes, I am not kidding. The cake today is a cross between a berry swirled pound cake and your favorite sprinkles loaded funfetti cake. What fun this cake looks! 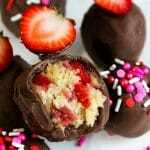 So playful with all the vibrant sprinkles and mention not all those pretty blackberry swirls. All of it covered in a 100% naturally colored creamy and fruity blackberry glaze. Then more sprinkles rained to finish things off. Believe me, it only sounds a lot, but doesn’t take much effort. We will get there in a few minutes. 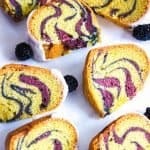 How is my blackberry swirled vanilla pound cake any different from other pound cakes? I haven’t used a pound each of flour, sugar and fat to make this one a classic pound cake (which I found a bit too dense). Don’t you? I lightened my cake considerably with less butter and sugar. But just enough to tick all the marks of a flavor packed and soft cake. You see when there is too much liquid added in the batter, the cake turns soggy. None of that is happening here. I used thickened homemade jam to give the purple batter a balanced rise. Also substituted half of the total amount of butter with clarified butter(ghee). This imparts five buckets full of flavor and the butter added produces a lighter textured pound cake. You may substitute curd in equal amount of the eggs used in the recipe. To compensate for the less fat used(which gives the rise to the cake) I increased leaveners to an acceptable amount. Also added a tsp of lemon zest to the batter. Worry not. Your cake wouldn’t taste lemony at all. It will just bring out the vanilla and berry flavor exceedingly well. Begin by creaming butter and sugar until light fluffy. Add eggs and flour to the bowl. Everything room temperature please! Mix in the flour, vanilla, lemon zest. Add some vanilla batter in the blackberry jam. Mix sprinkles in both the batters. Swirl the purple mix into the white batter with a knife and bake. I did not overdo the sprinkles or the swirls. Just a little bit of everything for that perfect blend of flavor from blackberry, vanilla and sweetness from sprinkles. Pound cakes have this reputation to dry out after a few hours of baking as the butter begins to set inside the cake. Thereby glaze/frosting is a must for pound cakes. But do you even care about the glaze when you have a sprinkles party going on all over your cake? Take it from me, this cake is just as good without glaze as well. But for the extra fruity punch I decided to go with the glaze. Check out all those beautiful air pockets in the purple swirls. The batter wasn’t liquidy one bit to take away the cake texture from the swirls. The swirls are not concentrated to a gooey mess but are filled with tiny holes that lifted the swirly batter along with the cake. If pound cakes aren’t your thing and you prefer lighter cakes, try this sunshine dessert. You will be blown away by its texture. Want a healthier version and still wanna enjoy some cake? Bake my banana nuts muffins with whole wheat flour. I can’t wait for you to bite into this berry infused, sprinkles laden, flavor packed buttery goodness bursting collectively in your mouth! Buttery and Moist Blackberry swirled Vanilla Pound cake that is loaded with sprinkles, masked with sweet and fruity blackberry glaze, then showered with more sprinkles...Sigh!!! 1. Preheat your oven to 350 deg F and grease/spray a mini bread tin 4 by 3 inches. Set aside. Sift cake flour, baking powder and baking soda together in a bowl. 2. In a separate bowl whisk butter, clarified butter and powdered sugar until light and fluffy. Beat in the egg. Add salt, lemon zest and juice, vanilla extract and mix well. 3. Add sprinkles to the batter. Take 2 tbsp batter and mix slowly in the blackberry jam. You may use a drop of purple color here if desired. I did too. 4. Drop the batter in the greased tin alternating the purple batter. And swirl the batter with a knife, lengthwise 2-3 times. 5. Bake the cake for about 35-37 minutes or until a toothpick inserted in the center of the cake comes out clean. 6. Make the glaze while the cake is in oven by adding whipping cream to the jam until combined well and turns a little thick and creamy. 7. 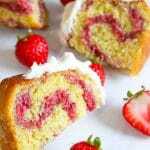 Allow to cool completely and spread the creamy glaze all over the cake. You may add 2.5 tbsp of butter instead of butter+clarified butter. But I strongly suggest to use the combination of the two. The flavor and texture magnifies 1000 folds that way. Use all the ingredients at room temperature only. The butter or the clarified butter shouldn't be melted. Just soft enough to be easy to cut through with a knife. Jam (if making from scratch) shouldn't be runny. Else lighter texture in the purple batter is almost impossible to be attained. Love your work ! Keep on rocking ! Will be back.Pinning ! Hi Neha! Your Blackberry-Swirled Vanilla Pound Cake looks so delicious! I love all the colors, and your photos look so appetizing! Great work!! Also, I love all the purple on your blog! It’s my favorite color!!! Hi Neha!! 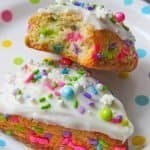 I love the idea of a pound cake with sprinkles and frosting! Pinning it!! Deepika try it once, you will fall in love with its taste. Thanks for pinning. Happy Baking!! Beautiful pictures and Absolutely delicious recipe! I’ve made many a poundcake, but I’ve never thought about sprinkles for it – that is so fun and festive! And the addition of ghee is genius! I like the idea of the jam for a swirl, I’m going to give that a try! Thanks for the inspiration! wow! If this isn’t the prettiest thing ever! Exactly Vanessa. I have since always didn’t like this fact about pound cakes. It had to be done. 😉 Thanks for stopping by! This is the prettiest pound cake ever!! Love the glaze! Take care. Cool cake. Thanks for the recipe! Glad to hear it Jason!